Large 5″ flat-screen color LCD video monitor with digital zoom and rechargeable batteries for handheld portability. Digital technology ensures a private and secure connection providing parents peace of mind, day and night. Q:Will this remotely pan and zoom from monitor? Does it have the two way talk feature? Q:Can you talk to the baby? Q:does this show room temperature? Q:Does it works with 110V or 220v? Q:Are the monitor functions always on or will it go to a sleep mode and turn on only to movement and sound? When the monitor is unplugged, it will go into sleep mode so all you will hear is sound. When pluged in, it stays on. Q:can the camera be hung on a wall? Yes the camera can go on the wall. Q:Are there any issues with internet interference? only because I have sketchy internet service. The monitor is on 2nd floor, and the video feed is on 1st. Love this product. Q:What is the quality of the image on the monitor? Is it clear? It is pretty clear during the day time and in color. You do have to make sure that the camera is lined up high and the lens centered. Otherwise, if your baby is all over the place. You may not see them. Night time vision is fairly dark, but you can still see if they are awake or not. Their little eyes look like a deer in the headlights! Overall. I am very happy with mine. Q:Do you have to have internet to use this monitor? Q:Can I purchase an additional power cord? Thank you for your question in regards to the monitor adaptor cord to the In View Monitor system. Yes the monitor adaptor cord is available separately. Q:Does it come with one or two AC adapters? Q:If I get an extra “Wide View” camera, would it be compatible with this model? Q:what is the battery life on the parent unit? How long will it last, on average, between charges? Q:Is it 110v only, or it also works on 220v? Q:Can the monitor be plugged up while in use, or do you have to put it out of service while you charge the battery? Q:Can I add an extra monitor? If I buy 2 set’s will I be able to see both camera’s on each monitor? Not sure, since that wasn’t a concern for me. I might suggest you call Summer Infant, Inc customer service in Rhode Island. I had a question prior to buying and they were very helpful. Please contact us at 1-800-268-6237, Monday-Friday, 8am-9pm EST, so that we can help troubleshoot this issue. Q:What is the resolution of the video? I don’t have the packaging any longer and couldn’t tell you the exact resolution. I can tell you that the pic in daytime is in color and very clear, the night time pic is is not in color and a little harder to see, but can always make out if baby is awake or not. This is the second set I purchased, I am very pleased with this set up. I paid more money for the first set and it was garbage, this has been a far better experience even tho it doesn’t have a lot of bells and whistles. It has the important stuff and does that well. I hope I was able to help! 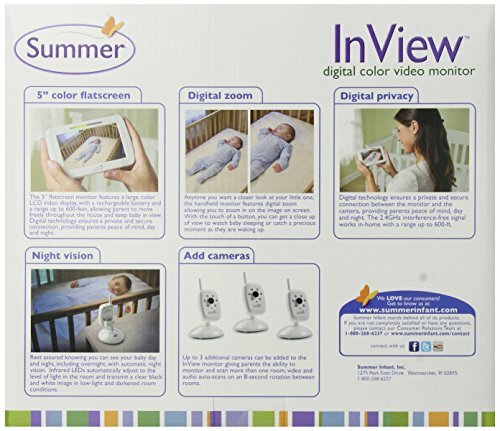 In addition, most Summer Infant monitors can be made into 4 camera systems with the purchase of an additional camera. Q:How many levels are there for the volume? I bought the Summer Wide View model and the volume on it is either off, low, mid, or high. There are 5 levels of volume. Q:What are the actual dimensions of the monitor – not just the screen size. Q:Can you turn the volume off? Q:Hi! Does it have a function where it displays the temperature in baby’s room? Q:Does this unit have a A/V output? No u don’t have to have the Internet for it to work. Q:can i add cameras to monitor multiple children or rooms. Yes you can. They are available to purchase on Amazon. Q:Does the monitor have split screen if you have 2 cameras linked to it? No. There is a timed function that switches back and forth between cameras or you can manually switch between them. Q:Can this be linked up to your cell phone to be able to see when you are away from home? 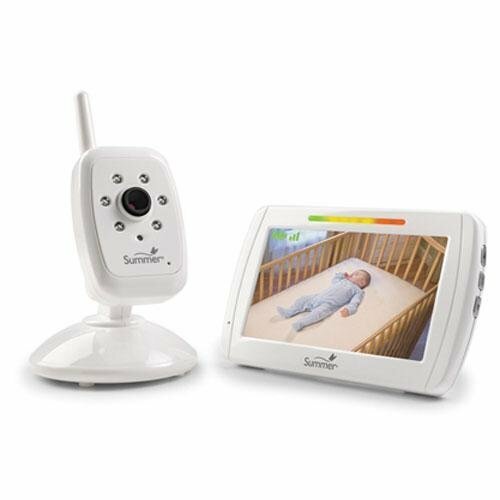 Q:I have 2 cameras from a Summer Infant slim & secure monitor I purchased 2 years ago. Will this unit be able to be synched with these cameras too? Unfortunately, none of our monitors are cross-compatible, they will only work with the same model camera and handset. Q:Make in USA or China? Q:Can i use both (camera and monitor) just with batteries? Q:Does it work at 110v or 220v? Q:Does works electric power 220V? Q:Is this auction for the camera and the monitor? Q:Hi! Is there an option to turn the video off, but still hear audio? Thanks! Yes. Just press the “video on/off” button on the top of the video. Q:Is the monitor or the camera running on battery? Or both? Is there no option for plugging into an electrical outlet all the time? I have mine pluged in to the wall at all times. When the monitor is fully charged it will last 6 hours.